FACTON’s Should Costing Cloud allows enterprises of all sizes to quickly deploy the solution in a software-as-a-service (SaaS) environment. Benefits of the cloud offering include the immediate availability, rapid deployment and scalability of the FACTON EPC Should Costing solution. It is easy to calculate the monthly fixed costs as a service and users always have access to the latest and most up-to-date software technology via the cloud. This greatly reduces maintenance expense and infrastructure costs for upgrades. FACTON’s Should Costing Cloud also makes everyday tasks easier for users without the need to change established and familiar workflows. 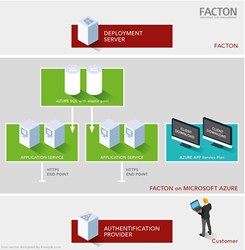 Full integration in the corporate network enables users to work with FACTON EPC via single sign-on. IT administrators work in the same administrative environment and continue to administer users in the company’s directory service as usual. Integrated offline capability is still available in the cloud, which is an important feature for employees who work from remote locations and need both online and offline capabilities. Enterprises will be able to switch to the cloud starting early August. Just like the on-premise version, pricing is based on the scope of the required modules and number of licenses. The Should Costing solution in the cloud is designed for enterprises of all sizes. The FACTON EPC Suite is the leading Enterprise Product Costing (EPC) solution for the automotive, aerospace, mechanical engineering and electronics industries. Its specific solutions offer robust answers to the requirements of executive management and individual departments within the enterprise. FACTON EPC enables standardized, enterprise-wide costing independent of location and department for maximum product cost transparency throughout every phase of the product life cycle. Businesses accelerate their costing, achieve pinpoint cost accuracy and secure their profitability. FACTON GmbH was founded in 1998 and has locations in Potsdam, Dresden, Stuttgart and Detroit. Hasso Plattner, founder and chairman of the supervisory board of SAP AG, has supported this innovative company since 2006. The international portfolio of customers includes Airbus, MahleBehr, Deutz, MANN+HUMMEL, Porsche and other renowned OEMs.